With Halloween out of the way and most of the candy stash depleted or donated, we’re ready to get down to business with our Thanksgiving planning! We’re looking forward to a wonderful holiday, full of family, friends, and delicious food, and we hope you are, too. Here at Clauss Orthodontics, we know how difficult it can be to cut back on the sweets and other traditional holiday dishes you love because you’re in braces. The good news is, you don’t have to sacrifice all your treasured Thanksgiving treats! We’ve put together a few helpful hints for keeping your time around the table braces-friendly, and we’ve also collected some of our team’s favorite family recipes. We’ve even altered a few of them slightly to keep them easy on the teeth – and your taste buds, too! Turkey, ham, or chicken will keep your braces in good condition, but make sure you’re not eating meat directly off the bone. Cut it into small pieces instead. Mashed potatoes, stuffing, cornbread, steamed vegetables, and good old green bean casserole are great choices since they’re soft and easy on your teeth. Pumpkin and sweet potato pies are the kind of desserts you can definitely indulge in, as long as you avoid any crunchy crusts or nuts. Keep in mind that any sweets should be consumed in moderation, braces-friendly or not, and don’t forget to brush once you’re done eating! Skip the salad stuff that isn’t actually salad! Those hard croutons, candied nuts, and crunchy crusts can really wreak havoc on your brackets. Leave sticky desserts behind on the buffet. Anything that has caramel, toffee, or molasses can linger on your brackets and wires and be hard to brush away. Whatever you’re eating, whether around the table, in your living room, or going non-traditional in a restaurant, make sure you’re still practicing basic braces care by brushing your teeth after every meal, and flossing before bed every night. Dr. Clauss’ Pumpkin Roll is the perfect indulgent breakfast for Thanksgiving morning. Grease a 10×15 cookie sheet, line it with waxed paper, then grease the paper. Pour batter in and bake at 375 degrees for 15 minutes. Sprinkle powdered sugar on a tea towel, then flip the cake onto the towel, remove the waxed paper, and roll the cake in the towel while hot. Cool for 1½ – 2 hours before unrolling. Cream together all filling ingredients and spread on pumpkin cake. Roll the cake again and refrigerate until ready to serve. Remember that Green Bean Casserole we mentioned earlier? Christie G. has a delicious version we think you’ll love! Mix soup, milk, and pepper in a 1½ quart baking dish. Stir in the beans and ⅔ cup French’s Crispy Fried Onions. Bake at 350 degrees for 30 minutes, or until hot, then stir. Top with the remaining Onions. Bake 5 more minutes or until Onions are golden. Serve immediately. Not sure about that pumpkin roll for breakfast? Marie J. has got you covered with her scrumptious Pumpkin Bread. In a large bowl, mix the shortening and sugar thoroughly. Add eggs, pumpkin, and water, then blend well. In a separate bowl, blend the remaining dry ingredients. Mix in optional ingredients, if using. Pour equal amounts of mixture into 2 loaf pans. Bake 65-75 minutes or until toothpick inserted in the center comes out clean. Cool on wire rack before removing from pans. Nothing says the holidays are here like sweet potato side dishes, and Mandi S.’s Sweet Potato Casserole is the perfect way to celebrate the season! Place sweet potatoes in large pot, cover with cold water, and bring to boil. Reduce heat and simmer for 15 minutes, or until very tender. Place cooked sweet potatoes in large bowl. Add brown sugar and next 3 ingredients, then mash. Scrape potato mixture into an even layer in an 11 x 7-inch baking dish coated with cooking spray. Top with marshmallows. Bake at 375 degrees for 25 minutes or until golden brown. This Corn Pudding by Karen P. is a creamy, buttery delight for anybody in braces. Pour into greased 8×8 baking dish. Veggies don’t have to be boring! Peter B.’s Cranberry Butternut Squash is the proof in the pudding. Heat the oven to 400 degrees, then bake squash with ½ stick of butter and salt and pepper until almost tender. While squash is baking, cook cranberries on stove top over medium heat with remaining 1/2 stick of butter and brown sugar. Stir constantly until cranberries are soft. Pour over squash and bake for 15 minutes. What’s Thanksgiving dinner without fresh bread on the table? Grace M.’s One Hour Bread is a heavenly addition to your family’s feast. Preheat oven to 44 degrees. Mix all dry ingredients, then slowly combine with 1 cup of warm water. Place dough in a well-oiled bowl, cover with plastic wrap. and let rest for 15 minutes. Place dough on lightly floured counter or board, cut into 2 equal pieces. Roll each piece into a 12-inch rope. Twist together & tuck in ends. Place into greased loaf pan and bake for 30 minutes. If you’re looking for a side dish to set you apart, look no further than these Creamed Onions by Cathy A. Melt butter in saucepan over medium heat, then whisk in the flour to make a paste. Mix water, then slowly add the milk and cream, stirring constantly until thickened. Add salt and pepper to taste, then stir in onions. One of the best things about Thanksgiving is all the leftovers! 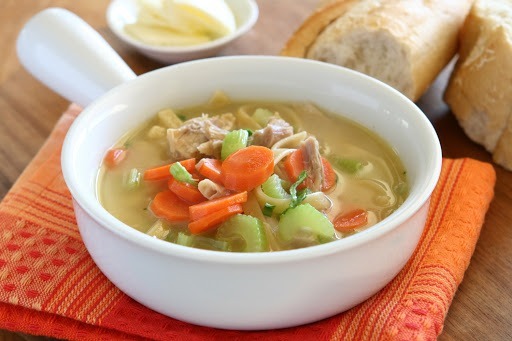 Level up from cold sandwiches by making this Leftover Turkey Soup by Susan J. In a large pot, combine water, turkey carcass, carrot, celery, bay leaf, onion, thyme, parsley, and fennel seeds. Simmer the mixture, uncovered, for about 1½ hours. Strain the stock through a sieve into a large bowl, then transfer the turkey meat to a cutting board, discarding all the bones and remaining solids. Finely chop the turkey meat. Return the strained stock to the pot, add turkey meat, and bring to a boil. Add tortellini, then salt and pepper to taste. Simmer until the tortellinis are just tender. Add spinach and simmer the soup for 1 minute. Wherever you are, whoever you choose to spend this holiday with, and whatever delicious recipes you decide to include in your feast, we hope you know just how thankful we are for you. May your Thanksgiving be full of food, fun, and adjustable waistbands!